Joseph Triner is featured in the Encyclopedia of Bohemian and Czech-American Biography. Joseph Triner (1861 – 1918), b. KaCerov, Bohemia, was a manufacturing importer and exporter in Chicago. His first factory was on Ashland Avenue, near West Eighteenth Street, but very soon it proved to be too small for the rapid growth of the business and Mr.Triner had to build a large, modern factory, situated on South Ashland Avenue and Hastings Street. The best known preparations manufactured there were Triner’s American Elixir of Bitter Wine, and Triner’s Angelica Bitter Tonic, both of which received the Gold Medal, the highest award in the recent Alaskan-Yukon-Pacific Exposition at Seattle, WA. Triner employed a large number of traveling men and city salesman. the trademark was registered on January 2, 1906 and that the remedy itself, a pioneer in it’s branch, was brought to the American market 30 years ago. That would put the start of the business around 1890, however, the first listing I can find for the business was in the 1900 Chicago directory. Around that time it was located at 616-622 Ashland Avenue and was categorized as patent medicines. As mentioned in the above biography, by 1911 the business had moved and was located at 1333-1339 South Ashland Avenue. Around this time they were making a number of proprietary medicines under the Triner name. 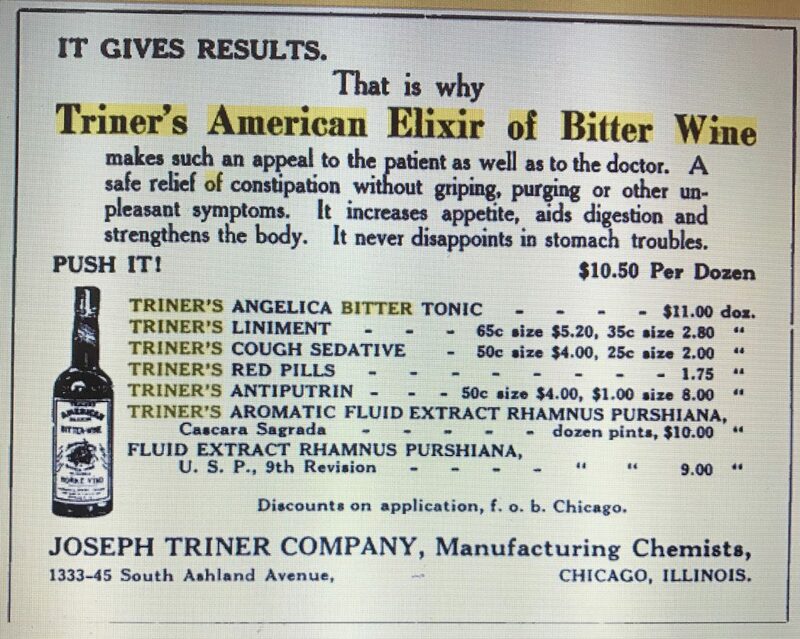 A 1921 advertisement in the “Midland Druggist and Pharmaceutical Review” listed: Triner’s American Elixir of Bitter Wine, Triner’s Angelica Bitter Tonic, Triner’s Liniment, Triner’s Cough Sedative, Triner’s Red Pills, Triner’s Antiputrin and Triner’s Aromatic Fluid Extract Rhamnus Purshiana. After Triner’s death in 1918, Triner’s son, Joseph, Jr., was named president and continued to run the business. The 1935 edition of “Who’s Who Among Association Executives” stated that Triner was: “President and Chairman of the Board of Joseph Triner Corp., mfg. chemists, rectifiers, importers and wholesale liquor dealers, Chicago, since 1919.” It still listed the business address as 1333 South Ashland. According to newspaper advertisements sometime on or before the late 1940’s the business moved to 4053 – 4059 West Fillmore Street in Chicago. 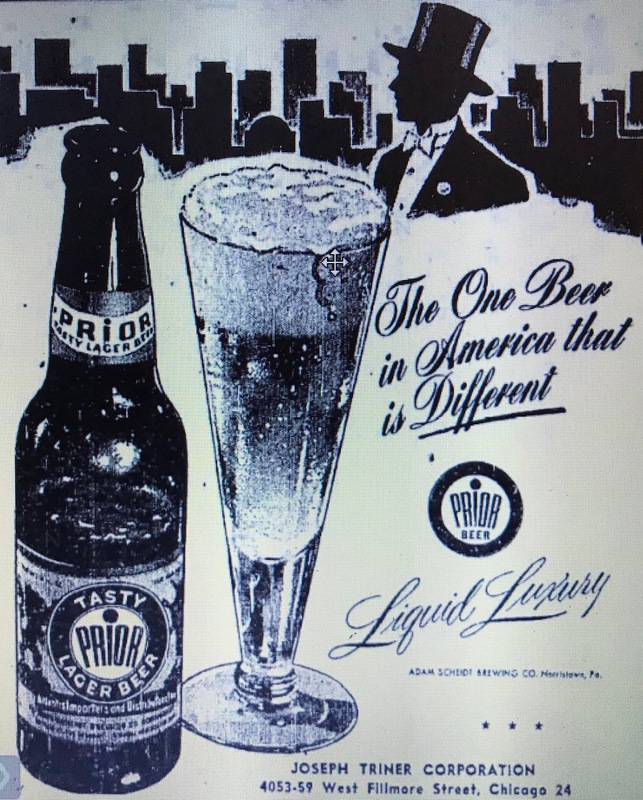 This “Prior Beer” advertisement from the April 5, 1950 edition of the Chicago Tribune included the West Fillmore address. 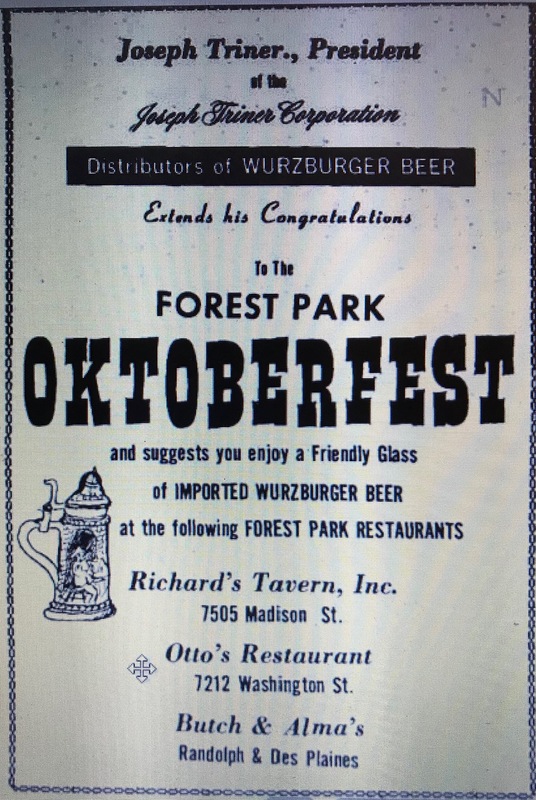 It’s not clear when the business ended, but a September, 1971 advertisement in the Forest Park Observer made it clear that not only were they still in business at that time but that Joseph Triner, Jr. was still the president of the company. It Acts Well and Is Very Palatable. These are the reasons why so many physicians recommend Triner’s American Elixir of Bitter Wine. Free from any chemicals. Prepared from bitter herbs roots and barks of eminent medicinal value and pure natural red wine. A safe relief in auto-intoxication, constipation, weakness, etc. Price $1.00. At drug stores. Samples gratis upon request only to physicians. It should be used in all cases calling for a safe evacuation of the bowels, without weakening the body or causing any pain or other discomfort; in loss of appetite, nervousness and weakness. Trainer’s Elixir of Bitter Wine consists of two principal ingredients, viz., Red Wine and Medicinal Herbs. Red Wine strengthens the intestines and regulates their work. It also increases the appetite, stimulates and strengthens the body. Use Triner’s American Elixir of Bitter Wine always when a thorough cleaning out of the intestines is needed. Arrange the dose to suit your conditions and habits. In chronic constipation the dose of Triner’s American Elixir of Bitter Wine should be increased or taken oftener. Many Female Troubles are caused or aggravated by constipation and ladies should always pay attention to this fact. Despite it’s 16 to 18 percent alcohol content and it’s less than glowing review by the A.M.A., it appears that Trinir’s American Elixir of Bitter Wine was legally available throughout Prohibition. In fact, in March of 1929, if you read the Harrisburg (Pa.) Evening News, you could send in a mail request for a free bottle. Not only did it survive Prohibition but Triner’s Elixir remained listed in drug store newspaper advertisements well into the 1950’s. The 1333 – 1339 S Ashland Avenue location is now a modern warehouse facility. Other buildings on the block appear to date back to the era of the business. The bottle I found is machine made and I estimate it to be a little over 20 ounces. It’s embossed just below the shoulder: “Jos. Trinner” on one side and “Chicago” on the other. 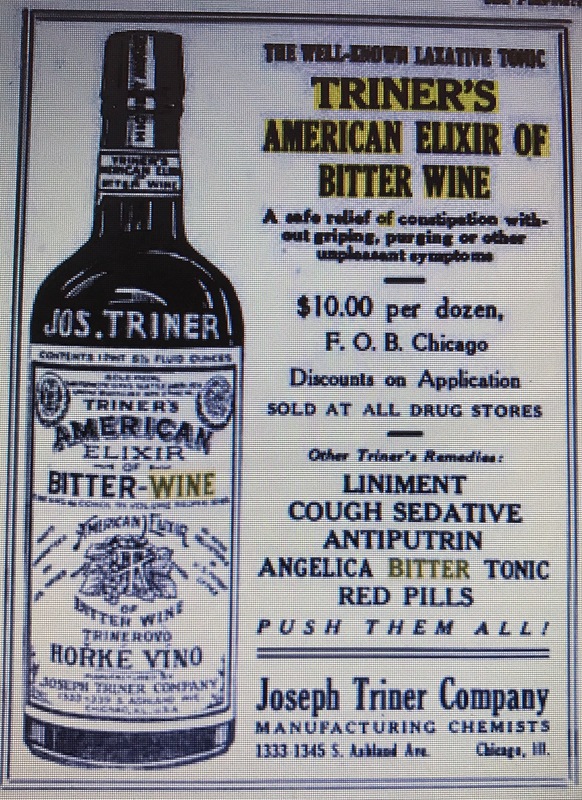 It matches the bottle in this 1920 advertisement for Triner’s American Elixir of Bitter Wine. Previous Previous post: J. Walker’s V.B.